This post is sponsored by Wholesome! – we used their organic honey in this recipe! Sweet, sweet creamy honey mustard sauce, I love you so! Honey mustard sauce means a lot of different things to me, but mostly what it means is that when I make it, I am going to get to eat something that will be dipped in sauce. And in my life, there are few things better than a meal dipped in sauce. Let’s take, for example, chicken. I’ve mentioned before that my true feelings for chicken are less than wonderful, but you guys. Some kind of magic shnazzery happens when I take chicken (ahem, the variety that’s been breaded and fried into chicken strips – just leave me alone) and dip it into this pool of honey-gold. It’s the kind of sauce that could smash your chicken-hater ways and turn you into more of a lover. I mean, a lover of all things dipped in the sauce. So, yeah, this is a conditional kind of love. Ever since doing our sugar free experiment, Bjork and I have really become honey snobs. Like, I get kind of picky about my honey. I love raw honey, but I always get a little protective about using my “good” raw honey in recipes where it doesn’t really matter what kind of honey you use. Which means we have at least three types of honey in our sugar-and-baking cabinet at all times – our raw honey, our regular honey (the kind you could use for baking in mass quantities without batting an eye), and something in between. 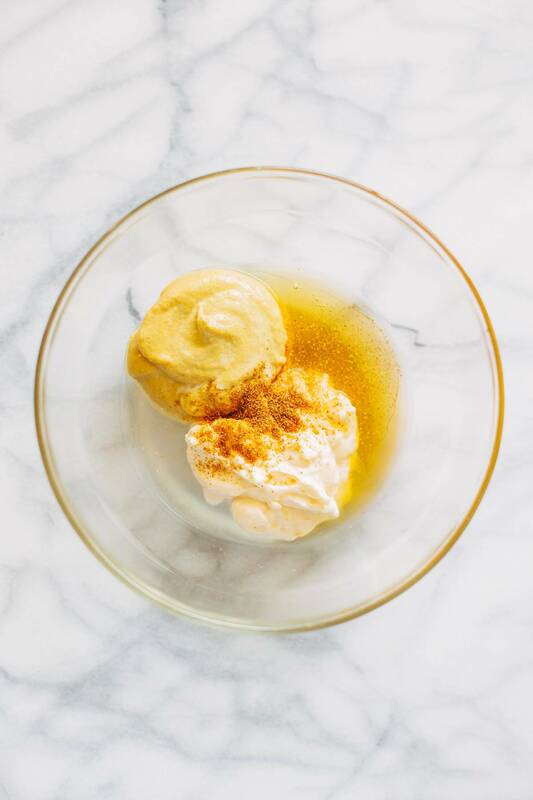 Raw honey could get a little awkward up in the whisk with this recipe, which is why I chose to go high quality but bypass the raw situation. This Wholesome! honey is organic and golden-delicious, like all the good honeys of the world, and I think I’ve mentioned before how much I love that they are selling these high quality organic products at my ever-so-convenient Target? Yes. High quality honey without a trip to the co-op. Life goal: met. PS. Wholesome sells raw honey, too. 🎉 Get yurself some of that. Let’s talk about how this only takes five minutes to make. Or not? No. Let’s not. I’ll just give you the jist of it: IT ONLY TAKES FIVE MINUTES TO MAKE. And realistically, more like three minutes, but I guess it depends on how long it takes you to find the dijon mustard on that condiment shelf in the fridge? Yoiks. Whatever you do, don’t imagine what my condiment shelf looks like. 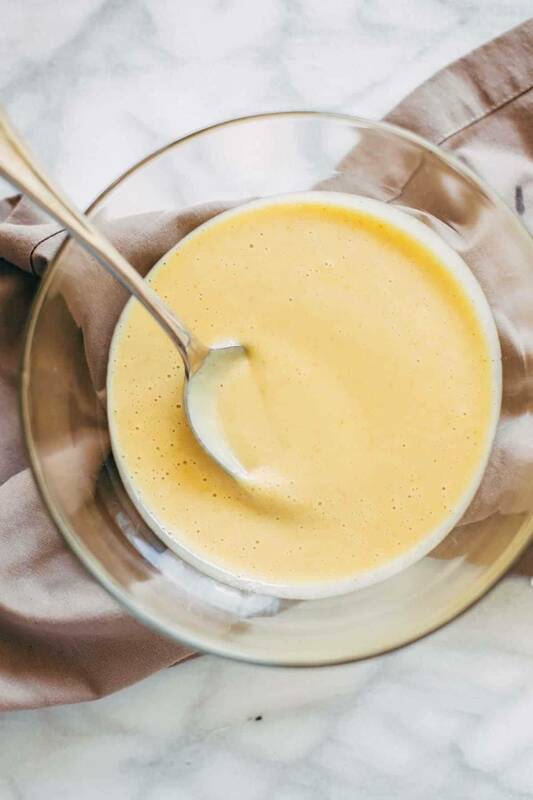 Do imagine yourself whipping up this dreamy sauce in about three minutes and sitting down to a plateful of something – roasted sweet potatoes, chicken tenders, baked tofu, or a green-y salad – coated in the most perfect consistency and sweet flavor of honey mustard sauce. 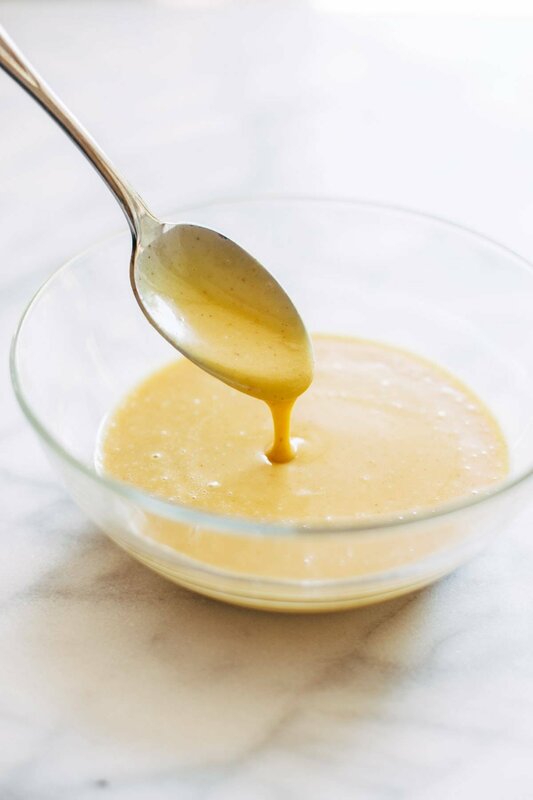 5 Minute Honey Mustard Sauce – just 5 ingredients to this smooth and creamy dipping sauce that can double as a dressing! So simple and delicious! Whisk all ingredients in a small dish until smooth. Thank you to Wholesome! for sponsoring this post! I have to tell you – it’s so awesome to see our readers supporting the brands that we love / the brands that support Pinch of Yum. Tag me on Instagram to show me what you’re doing with your Wholesome! products! So quick and easy! Love it! You know the way to my heart. Haha – your heart and mine might be one in the same! um. my boyfriend will FREAK if I make him homemade honey mustard! he LOVES the stuff. puts it on nearly everything. oy. thanks linds! Ha I love that you have special “baking honey”. I feel the same way about my pure maple syrup-its just too delicious not to be the star ingredient!! I usually go half and half with honey to appease my maple syrup hoarder tendencies. Good call! yeah – I just can’t handle using up the precious raw honey in recipes like this. I love honey mustard! I’ve made my own before to glaze chicken and salmon, but I’ve never added mayo before – I’ll have to give it a shot. Yum! Funny – we actually had this with salmon the very next night! Just made this – SOOOOO good! I wish I would rate this recipe 10 stars! Will definitely be a new staple with my chicken! Thanks Lindsey! Love that Rachel! Now I need some nuggets to go with it! Is it wrong that I sort of want to just make a HUGE vat of this sauce and then swim in it for awhile, before slurping my way out of it? Whatever. I lovety love LOVE honey mustard, so this is my jam! Pinned! I know. Me too. ON EVERYTHINGGGG forever. Honey mustard is one of those things that sounds so simple (it’s honey and mustard – combine), but it’s never quite right if you just mix the two in equal parts. Thanks for figuring out and sharing the secret 🙂 YUM. Cath! You named my dilemma. That’s what I’ve always done and it is NO GOOD. Thanks for the comment! Yes! Gives it a tiny little kick! Thanks for the idea Linda!! Can you add the nutrition/calories? Thx! Love how quick and easy this is! This would be sooo tasty over soft pretzels! I have to check out that honey too. I can’t even. I love you so much for that idea. I also really love honey. I think it’s just me being in touch with my inner Winnie the Pooh. And this sauce does sound like it would be good with baked tofu. Yum. oh my gosh, you’re funny. I literally have “baked tofu” written on my kitchen chalkboard because I need to dip it in honey mustard. Great idea to drizzle this on sweet potatoes! That’s what I’ll be doing with my batch! Love this recipe, and I like that it takes a mere 5 minutes to whip together. Fast and easy! my fave! Never knew making the honey mustard sauce is this easy. Excellent recipe !! This one is going with my grilled shrimp this weekend. Thanks. There’s a guy at the farmer’s market one town over who sells like eight million kinds of raw honey–wildflower, blueberry, clover, and they all taste distinctly different. It’s amazing. Will definitely have to make this sauce with some of that! Are you in the twin cities? Is it Ames honey by chance? They are amazing!! We’ve been fans for a long time. The only sad thing is that you have to travel to the Farmer’s Market to buy it – so during the 10 months of the year that I’m shopping indoors at the grocery store, Wholesome conveniently fits the bill (especially now that they also sell raw honey)! Mmm! Chicken tenders dipped in honey mustard is spot-on goodness! 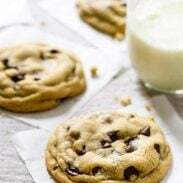 Thanks for this quick recipe–pinning now! I was literally JUST googling honey mustard recipes last night! You always come through with the recipe I’m craving, right at the moment I need it. Honey mustard for the win! Yum! Made using greek yogurt instead of the mayo and it was tasty! The cayenne gave it a great flavor. Interesting that you’ve become a honey snob. I think I’ve always been one – I’ve never really liked honey until I discovered mesquite honey. That’s one of those wonderful things one discovers when living in the desert in far west Texas. It would be interesting to try raw honey, as long as the flavor isn’t too strong. For me, too much of the honey available has a strong flavor that dominates whatever it’s part of. I need to try mesquite honey! sounds amazing! I was just looking for a honey mustard salad dressing recipe and saw your instagram post! It was fate I guess. 🙂 This looks like pretty much the best dipping sauce ever to grace the interwebs. Have you tried this as a salad dressing yet? Yes – we had it on a kale/mango/purple cabbage/pistachio salad a few days after I made this and it was perf. and I’m talking in a strictly how our bodies process things kind of way. My understanding is that sucrose is sucrose whether it is white sugar, brown sugar or honey. Honey does have nutrients that sugar does not but if a diabetic person ingested sugar or honey, bottom line, the outcome would be the same ….less is better. Thanks for sharing your knowledge Linda!